Today started off on a sad note but ended on a spooky one. I know that sounds weird but today was an unusual day. 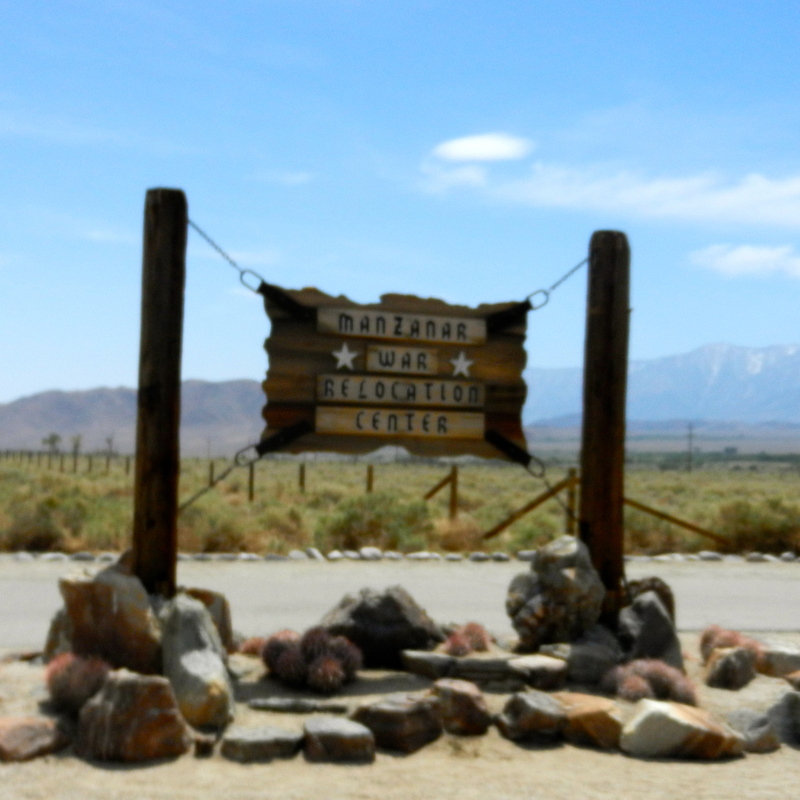 North of Lone Pine I stopped at the Manzanar War Relocation Center. This is where 10,000 Americans of Japanese descent were relocated during World War II. They were removed from their homes and business and with only the clothing they could carry were forced to remain here throughout the war. This is the entrance and a guard shack where they were closely watched so that they couldn’t escape. The only reason they were isolated here was because they were Japanese. They had done nothing criminal, but the government thought they might be a problem to our security. This is the main building where they had dances to try to forget about their situation. 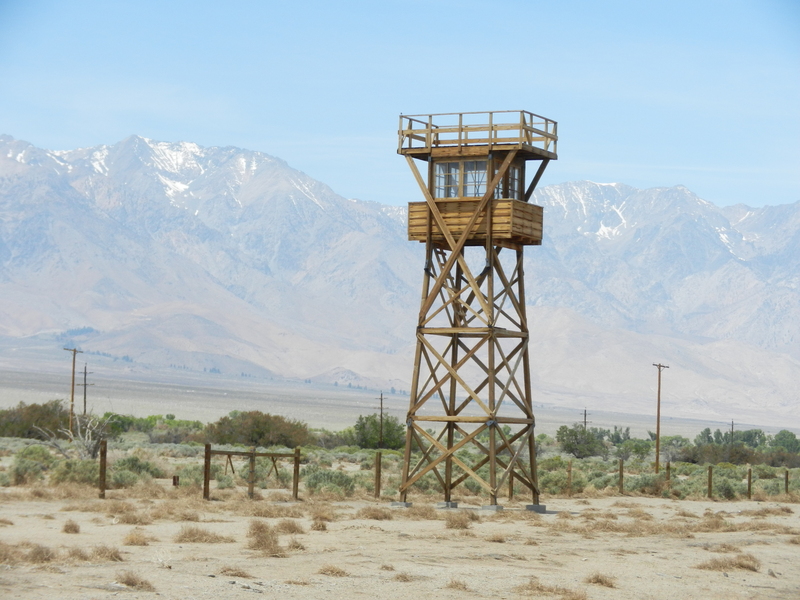 This is one of the guard towers to prevent them from escaping. There was a 20 minute movie narrated by many of the same people that were encamped here. It was a real tear jerker. Years later Ronald Reagan issued an apology to all those who were encamped here and their relatives along with $60,000 per person encamped. But by that time they had lost some much. Many of them owned businesses and shops which were taken away from them. Stopped in Bishop at Schat’s Bakery to pick up a loaf of their famous Sheepherders Bread. It is to die for! Thanks Donna and Russ of Travels in Therapy fame for reminding me. I didn’t really have any particular spot where I would stop for the night except to park somewhere before 4:00pm. I passed many small towns along 395 and had heard about a dispersed camping spot at Mono Lake so I decided to make that my destination. Along the way I passed Mammoth Lakes, which brought back a lot of memories of my skiing days and how our ski club used to go up there once a month in the winter. It sure looks different in the Spring. Still lots of snow on the peaks but a lot of greenery in the lower elevations. 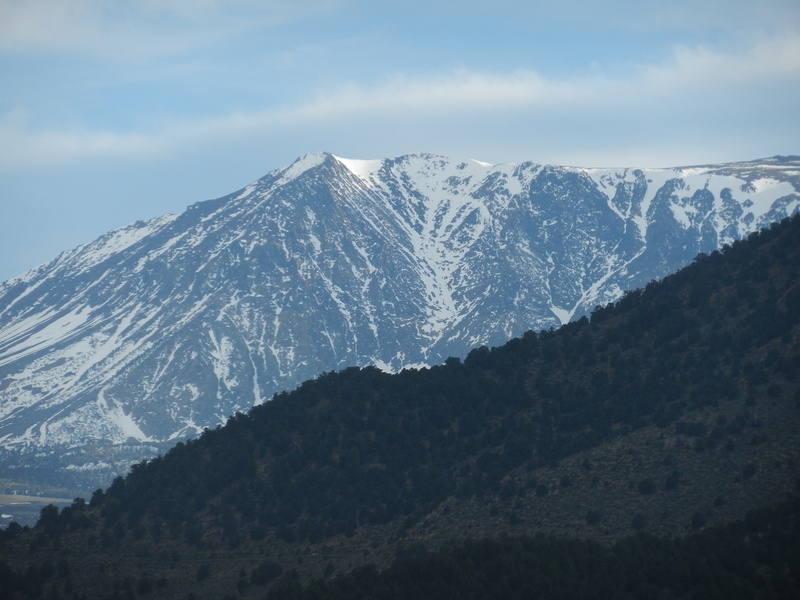 I found a perfect spot just off 395 south of Lee Vining. 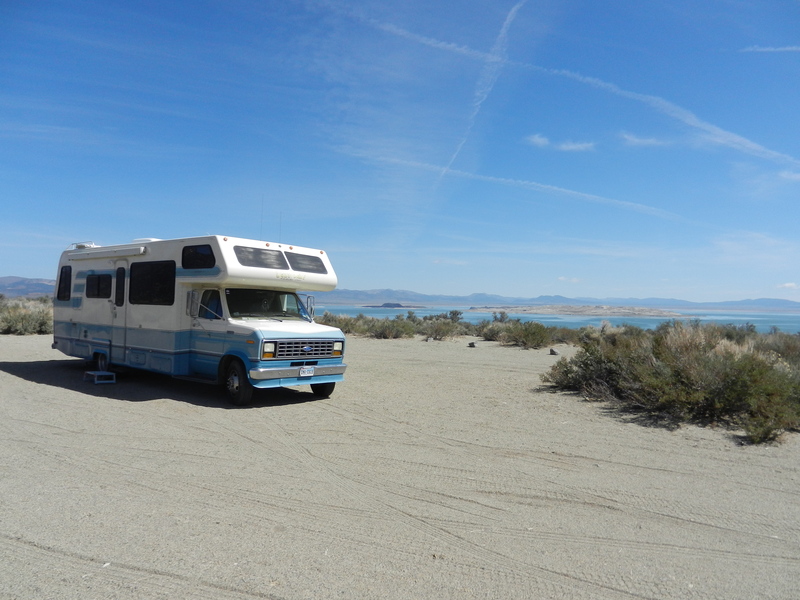 It is a great dispersed camping spot overlooking Mono Lake on one side and a great look of the mountains on the other side. 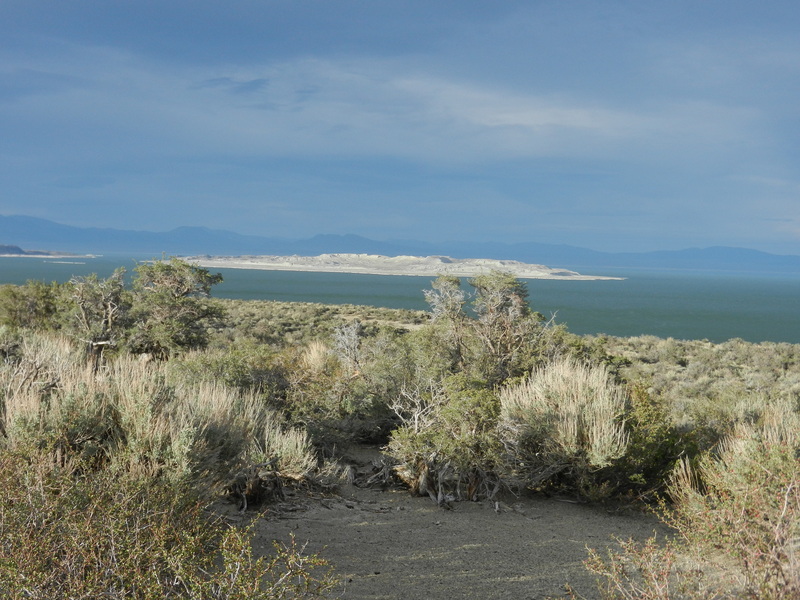 Mono Lake is twice as salty as the ocean. Tomorrow I will hike down to check on the tufas. 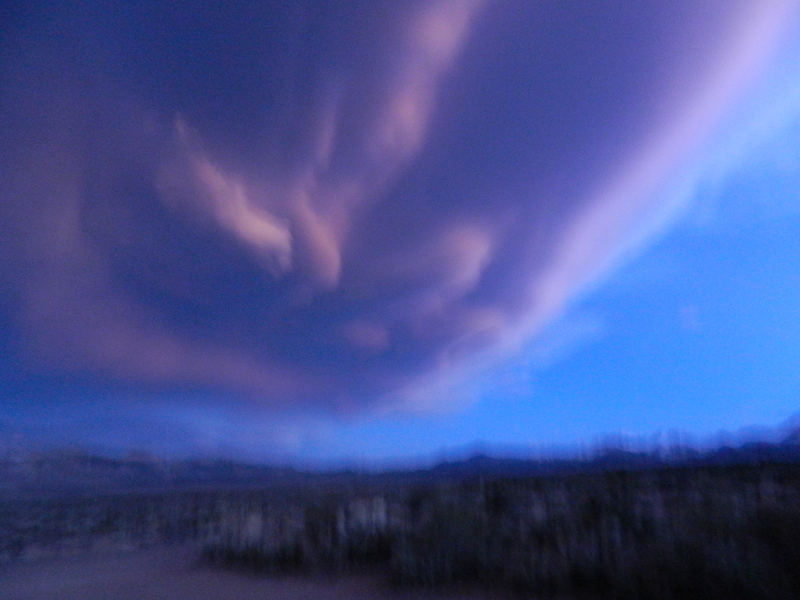 Here is a great pic of the clouds rolling over my campsite. More on that later. The mountains were really beautiful with lots of snow still covering them. 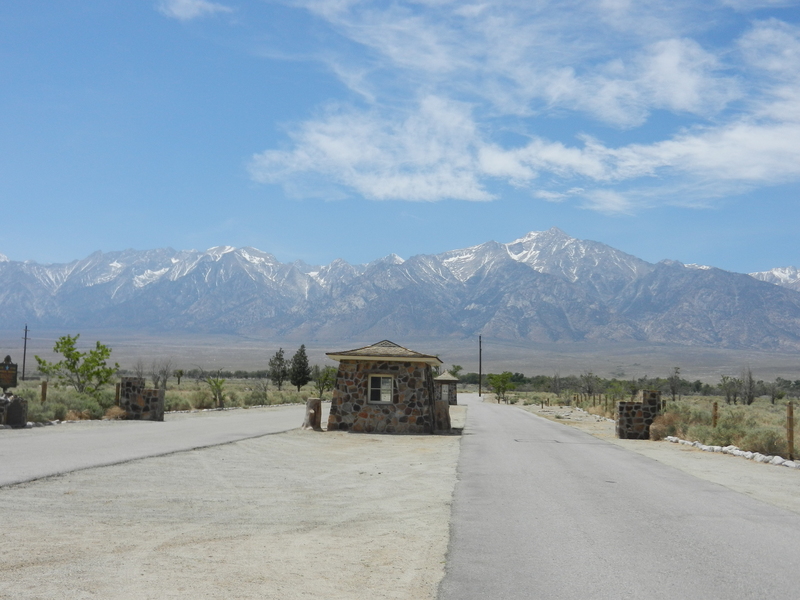 I am at the 7,000 ft level and there is lots of wind and it is a bit colder there then the Alabama Hills. But it is still very pleasant. I went outside to take some pics before the sun went down and looked up and saw the Starship Enterprise hovering overhead. At least that is what it looked like. This pic is facing south and has a bit more light as it was a timed exposure. This is the scene that really had me spooked out at first. Yes the Enterprise was landing directly over me. Beam me up Scotty! I couldn’t believe my eyes. I then googled “Mono Lake Clouds” and found out that these clouds are called Lenticular clouds and are common to this area. But it scared the “you know what” out of me for a while. I will be spending a couple nights here to see more of the lake, so stay tuned. 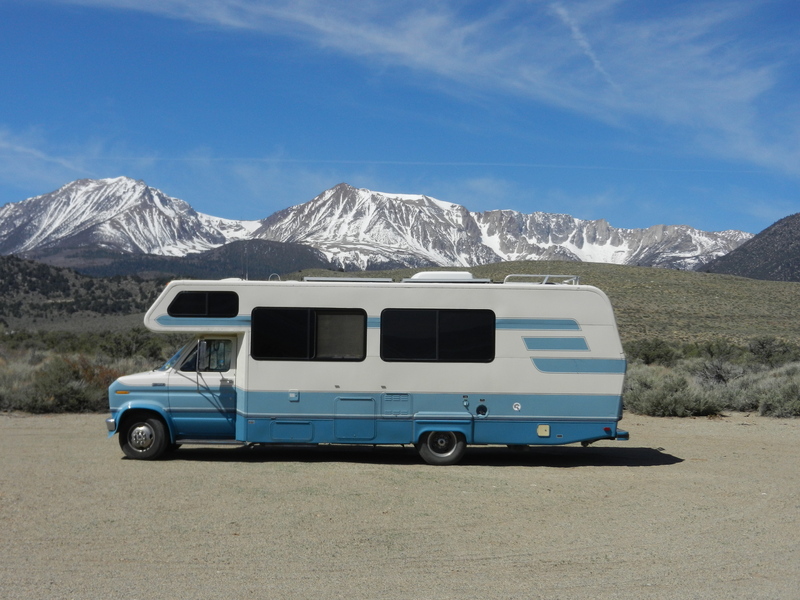 This entry was posted in BLM Land, Boondocking, California, Mono Lake by Jim Melvin. Bookmark the permalink. So, are you now with Scotty? 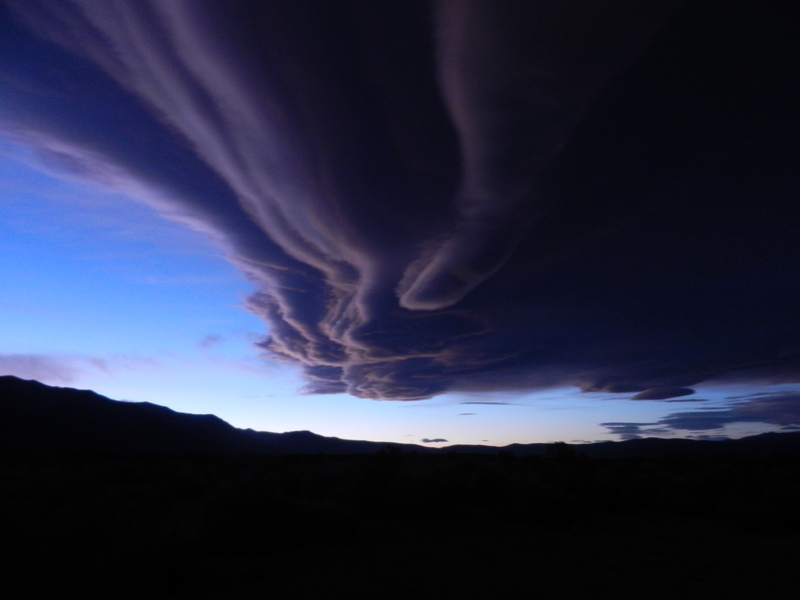 I have not seen the Lenticular clouds before and have spent a great deal of time at Mammoth. It’s a first for me. Aren’t you glad you have your computer to educate yourself with when an out of the ordinary occurrence happens? Loved the mountain view and looking forward to Mono Lake photos. I’m hoping to have the family up that way at the end of the month — IF I can get my rear-in-gear and find a place to stay.. Many of the sites are filling up QUICKLY now.. Doh! 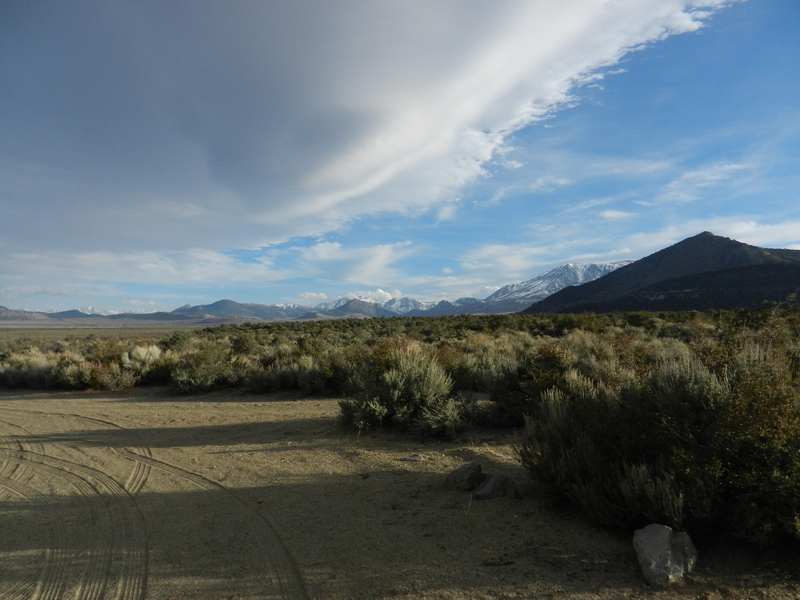 Of coruse there are a few sites up near Tahoe and beyond on the 395..
Great views and love the clouds. Will have to try to get there. 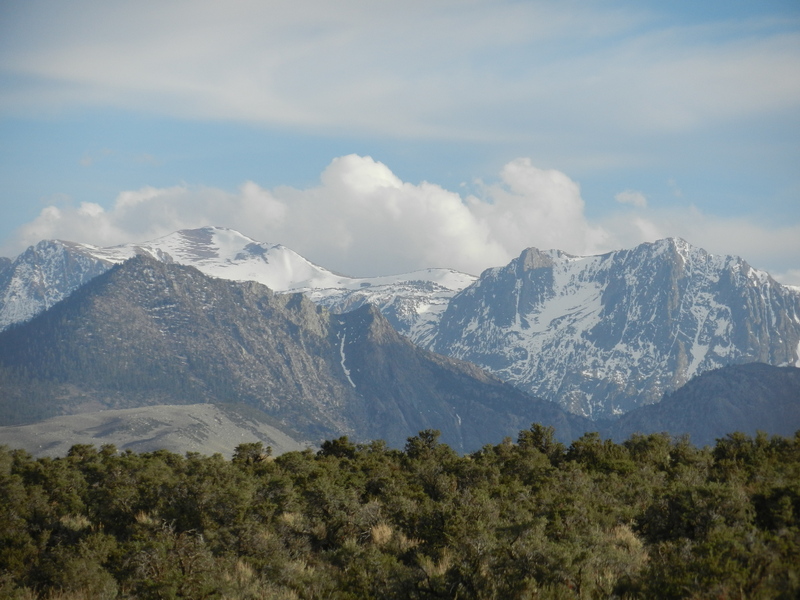 You are in my favorite area on earth…..I love the Eastern Sierra’s. You are, obviously, very near Lee Vining….several great restaurants in town, and the ice cream place is wonderful. Your pictures are spectacular! Be safe! I so love cloud pictures and those are just incredible. Definitely would make you wonder what was actually happening. 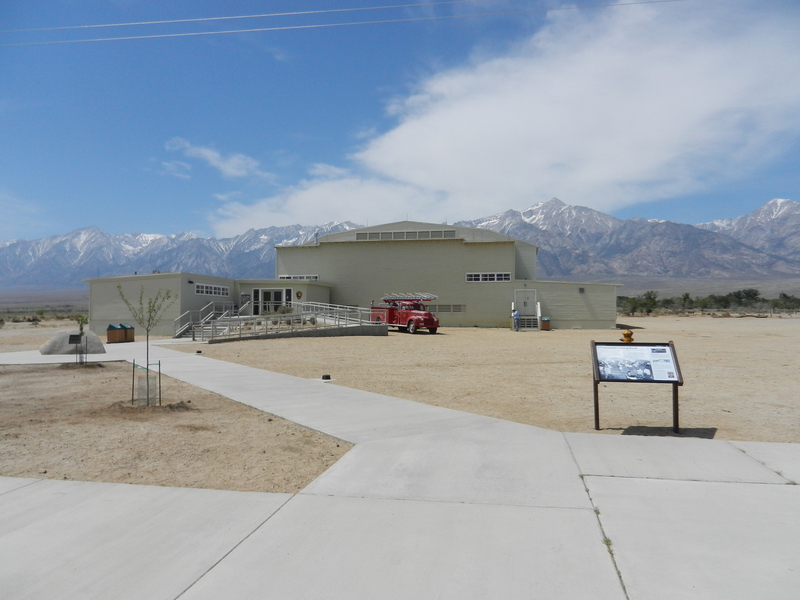 There is also an internment place in Wyoming and we stopped there. Terrible time in our history. Really interesting cloud formations. Being from Texas, I would have been worried about severe weather. possible tornadoes in the area. Even if there are no tornadoes there. When we visited Mono Lake (1997) we were chased by a blizzard coming up from the Yosemite Park direction. Back then I had only a paper picture camera. I do so love the eastern sierras. Glad you remembered to stop at Schat’s. Did you get me a loaf haha?? I agree the internment camps were a terrible time in our history but what people tend to forget is that we were at war and war is always ugly . You have to place the events in context of what was happening on a world wide scale. There was fear and we had been attacked and many of our troops and innocent people were killed. Were the camps fair to the Japanese citizens? Not at all, but war is not only ugly, it is unfair. What was done was not done out of malice but in the thinking of the time, it was done because the leaders of the time did not know who they could trust. They were doing what they thought would protect the country. It is easy to have 20/20 hindsight and wish the internment camps had not happened but all we can do is remember and hopefully learn from the situation. I would venture to guess that the camps that were established on US soil were a whole lot better than the camps that our troops and innocent individuals overseas were subjected to. Just my opinion of course. Awesome cloud photos, Jim. Just where are you – Vista Drive behind Whoa Nellie Deil, or someplace on the east side of 395? Vista Drive is the only spot I know of in that area. I am on a road just south of Lee Vining called Test Station Rd. There were a couple of good boondocking spots there.